Pawn Golf Clubs / Golf Sets for Cash Now! B and B Loan is happy to loan cold, hard cash on your golf clubs and golf sets in minutes. 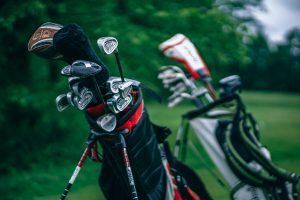 Whether a golf pro or an amateur, some golf sets can run you hundreds even thousands of dollars, making them an easy source of cash when needed. Pawning these clubs, no matter if individual clubs or sets, is a fast process that lets you turn it back into cash while still maintaining the option to get the item back. Pawning your golf clubs is quick and easy in Mesa, Tempe, or Chandler. B and B Loan has been the leading pawn shop in Mesa for well over a decade, making our cash loan process as fast as possible. If you’ve got an entire golf set, or just a golf club (like a putter or driver) we’re happy to make a cash loan. We start the process as soon as you come down to our Mesa Pawn Shop with your golf clubs. One of our associates will inspect it for condition, brand, and overall market value for the item. This part is usually pretty quick, but to try and get you the most cash we’ll look at every aspect possible of the golf club to be sure. Once we’ve got a good idea of its worth, we’ll make you a cash offer. When you accept, we’ll just collect a few signatures and send you on your way with cold, hard cash. You can rest assured that your golf clubs are safe and secure in our insured storage facility. According to Arizona law, each of our golf club loans is written out for a term of 90 days. You’re welcome to come and pick them up any time during this loan term without paying any extra interest. Come the end of the term the interest and principal amount is due, but we’re happy to be flexible. We’re not in the business of repossessing your golf equipment, but getting you cash. You can simply pay off the interest that accrued over the 90 days and we’ll rewrite the loan for another 90 days, no problem. We’re the pawn shop Mesa trusts for your sporting equipment, no matter if you’re in Tempe or Chandler, we’re the only place worth visiting.